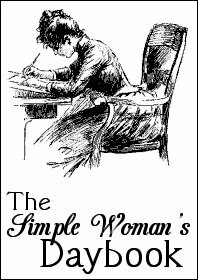 I started out 2016 with the intention of writing a monthly post with The Simple Woman's Daybook community. Although I was faithful most of the year, I missed June, July, August ... having spent June getting ready for our upcoming trip to England and Scotland, then spending all of July traveling throughout the beautiful United Kingdom 'breathing English air', and when we arrived home in August that month was spent catching up on unfinished garden and yard projects. The Woman's Daybook is a simple and pleasant format around which to formulate ideas and thoughts for writing a new post every four weeks or so. By following a list with basically the same prompts each month, it becomes a delightful way to record a few snippets of daily life, thus creating something like a long newsy letter for my beautiful readers and a diary of sorts for myself. I know I lament too much at how quickly time flies, but it really is hard to come to terms with the fact that here we are hurtling through the last month of the year as if someone is about to guzzle the last of the eggnog. 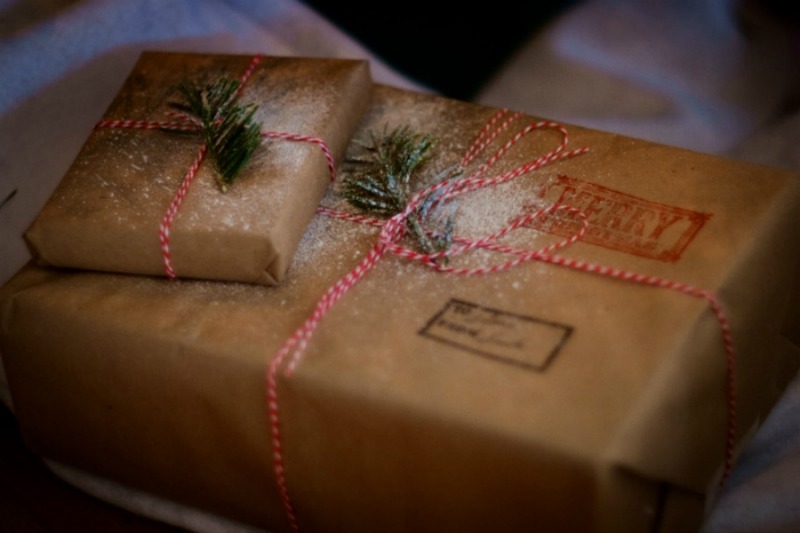 But since it's here--and yes I love December--it means this is my last Daybook post for the year. That sounds kind of sad, doesn't it? Then I'm reminded a brand new year is about to unfold, and as this Daybook format fits my writing style and voice ... and since I've received such lovely feedback from so many of you telling me these posts connect with you, I'm delighted to carry on in 2017. Why change something that works for me ... and apparently ... for you too. So, here it is, dear friends, this year's last shining star: the December edition of The Simple Woman's Daybook. Outside my window... For the last few days it's been charmingly crisp and c-o-l-d. No more dreaming for a white Christmas -- we have it in full orchestra. People were caught scrambling for their heavy parkas and gloves the other day, and with the temperatures now groveling well below zero, let's just say we won't imagine Spring any time soon. Depending on the time of day I looked out yesterday, the sky was pale as rice paper in the morning, and just before the sun dipped below the horizon shortly after four o'clock in the afternoon, the light like soft creamy butter, was maybe the colour of lemon snickerdoodles. This morning as I finish up this post, the sun came out in full force. The snow glistens on roof tops. Skies are clear in a frosty shade of blue, and chickadees whistle in the backyard. I am thinking... there is something a little festive about standing in a line up at the post office this time of year. I've been four times already in the last couple of weeks -- once for stocking up on seasonal postage stamps and thrice for sending off small parcels or slightly stuffed envelopes. There are folks like me who arrive with boxes carefully wrapped and fastened securely with tape; others come with ... well, you do wonder if their parcels will indeed arrive at their destination or will their contents spill out somewhere along the way for being so poorly packaged in too thin paper and tape that barely sticks. It makes me want to offer to rewrap the packages for them. People seem patient as they wait in thick winter coats holding boxes and bundles of envelopes. There's a certain spark in the air. Someone gets into a conversation with the person in front of them, chatting about who they won't be seeing for Christmas this year and hence the gifts in the mail. There's the Grandma and Grandpa standing at the counter with heads together, no doubt deciding which is the most economical way to send off their precious cargo. There are mothers and daughters, sons with dads, not to mention aunties sending off plainly--sometimes gaily--wrapped bundles for loved ones. Sigh ... yes there's something wonderful about this time of year. It makes me hope all those hard working postal workers get their fair share of spiked spiced eggnog and gingerbread cookies when they are finally done their shifts. I am thankful... for my simple pleasures, that my family and friends are all in reasonable health this year, that Rick and I are well too. And that we don't need a lot to be happy, but I'm grateful for all the many blessings of good food, a place to call home, utilities and furnaces that keep working during this frigid weather, hot cups of tea after being outside. My cup runneth over and I'm sipping from my saucer. I am wearing... A long-sleeved L.L. Bean black t-shirt, black jeans, slippers. The house feels cool so no sleeveless tops for this girl today. I am creating... a mess in my study/office. I ran out of bookshelf space and now there's a pile of recently acquired books on the floor waiting for a spot to call home. THEN I saw this photo on Facebook called the Snowman Book Sculpture. 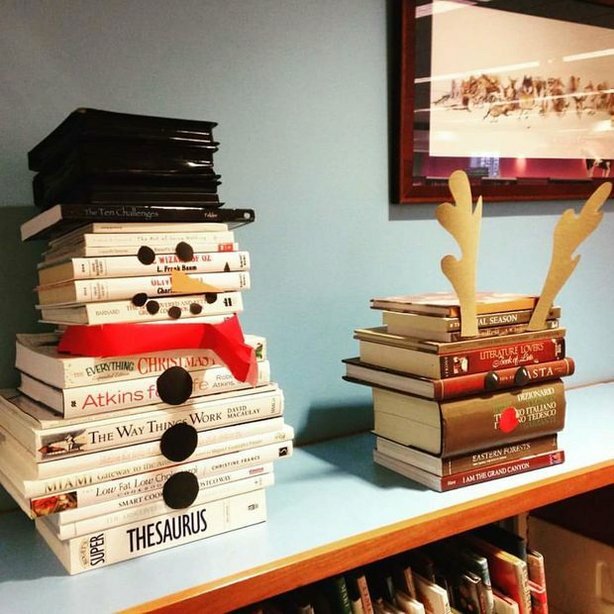 Isn't that a fun and creative way to dress up books for the festive season? It looks pretty simple to make, but if you want the instructions, you can click here. I am going... on a little shopping date with Rick this afternoon. C-h-r-i-s-t-m-a-s is in the air! And we're going out for lunch too. Woohoo! I was wondering... what to make for our dinner tonight. We took out chicken breast earlier, but I see dear hubby has already pulled out a recipe for lemon chicken. Gotta love that man ... and I do ... very much! While he's having a wee nap, I'm going to surprise him and get it started. I am reminded... that somewhere in my travel souvenirs, I have two Christmas tree ornaments I bought while in Scotland. Of course, they are in tartan ...aren't they sweet? I just love the kitty one. Soon they will be waving from the branches of our Christmas tree; hubby set it up for me and I'll be decorating this weekend. I am reading... Winter Solstice (for the umpteenth time) by Rosamund Pilcher. It's one of my holiday favourites. It promises cozy reading for these dark and frosty winter evenings.With a satisfying plot and characters that one begins to love like their own kin, the author takes the story threads and weaves them like tweed in a Scottish woolen mill. Thread by thread, chapter by chapter, we meet Elfrieda, Oscar, Lucy, Carrie and Sam. We watch them grapple with their individual disappointments and heartaches. We cheer when hope glimmers and they begin to see that “beyond the pain, life continues to be sweet.” When you've finally read the last page, you realize you've been holding your breath just a little and now you can breathe out, because it all turns out just as it should, just in time for Christmas. Something else on my Christmas reading pile is Christmas at Thrush Green by Miss Read. I know many of you have read her books in this series, but as yet I have not. I am looking forward to delving into the Christmas episode, hoping it won't be too difficult to sidle in the side door and warm up to new-to-me characters in this seasonal tale. For my quiet reflective time I've been reading a stirring little book by Dietrich Bonhoeffer God is in the Manger, Reflections on Advent and Christmas. He was a German Lutheran pastor in the 1930's, was arrested in 1943 by the Gestapo and imprisoned for being a Nazi dissident. He was executed near the end of the war as the Nazi regime was collapsing. But he left behind many of his inspiring writings, including the short excerpts from his letters and passages from his Christmas sermons. I'm taking comfort and joy that this man could still find the joy of Christmas even while sitting in a prison cell or concentration camp. I am hoping... to finish writing out my cards and notes this weekend. 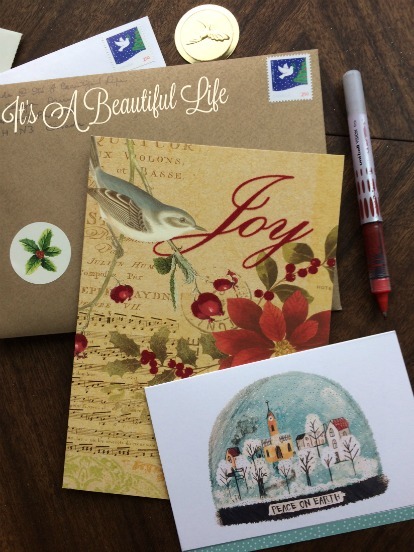 As much as I love writing out Christmas greetings by hand, I don't do as many snail mail cards as I used to, for I also love sending out those beautifully designed Jacquie Lawson e-cards. In my garden... The blue jays, magpies, chickadees, downy woodpecker, not to mention the silent tracks of our neighbourhood bunny who must have visited in the night, all add a certain joy to our snow covered yard. 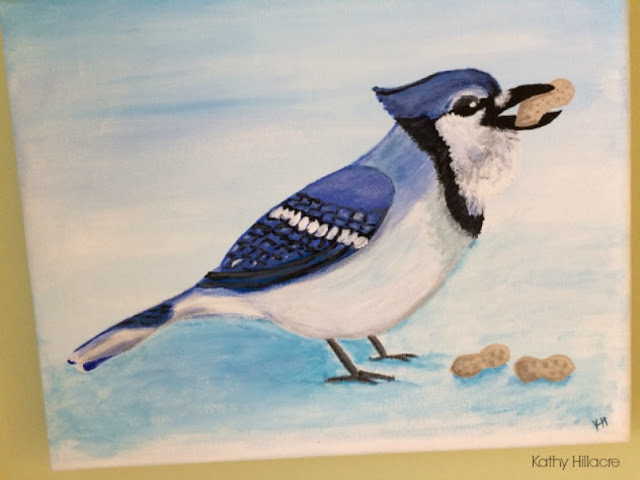 The Jays are quite vocal about requesting their fair share of the peanut handout, and will step up to the backdoor and peer in. Which is why I love this little picture below that my sister painted of one clever fellow. A favourite quote for today... "When giving treats to friends or children, give them what they like, emphatically not what is good for them." ~ G.K. Chesterton. One of my favorite things... is singing Christmas carols and songs at this time of year. I'll find myself humming snippets of Deck the Halls, Joy to the World, Handel's Hallelujah Chorus, Jingle Bells ... even that crazy old song 'Grandma Got Run Over By A Reindeer' if I hear it on the radio. From Pinterest board room... We might not have new Downton Abbey episodes to watch this year, but the lovely tree is up at Highclere Castle. Is that not a fine specimen of a Christmas tree, all bedecked and ready for this holiday season? Rick and I visited Highclere Castle this past summer; what a wonderful day we spent touring the house and gardens. We stood in that very room, looking around with mouths agape. It all felt so familiar -- I remember walking very slowly down that grand staircase, imagining Lady Edith standing there in her beautiful wedding gown on her true wedding day. I couldn't take photos inside the house, but how could one forget those beautiful settings after all the episodes we've watched. I don't think I'm ready for the complete series just yet, maybe after Christmas; but I might need to watch that sublime Christmas episode where Matthew proposes in the snow and Mary finally says yes. 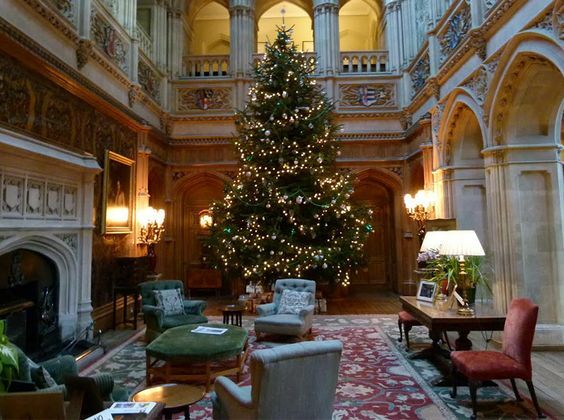 Aside ... Highclere Castle is hosting a Sing for Peace fundraiser on Dec 11th. After looking at the list of lovely hymns and songs being sung that day, I do wish I could pop over and join them there. Post Script... If you missed my previous posts in The Simple Woman's Daybook series and want to check them out, you will find the set here. filled with glimpses of heaven in unexpected places. Brenda, your lovely blog is a blessing to me. I love this Simple Woman's Daybook format of writing...and you do it beautifully. And oh...how I would love to visit Highclere Castle! What an experience. Upon seeing this gorgeous tree in this gorgeous room, I'm afraid I am missing Downton all the more! :( Enjoy your weekend, Brenda! Lovely thoughts, as always. You are a gifted writer, my friend. Yes, dear Brenda, you are perfectly suited for this style of writing. I so enjoyed it. What a delightful post, Brenda. Another month with a charming visit with you, Brenda. Just lovely. Wouldn't it be delightful to sit in that room at Highclere and have Carson bring in the tea tray while we chat and sip? And do plenty of ogling the surroundings! I'm writing this on the ferry, heading over on a very monochromatic morning - thousands of shades of grey in every direction - for a Christmas celebration with my parents and siblings. Enjoy your weekend and the crisp cold! I love your daybook. The idea for the festive books is really cute. I tend to put mostly green and red books on my shelves during December. I have quite a collection of "Twas the NIght Before Christmas" as well. I think I have over a dozen different editions now. Some from when I was a girl. Brenda, reading your daybook is a treat! You have a loving Mama's heart in wanting to help others wrap their postal packages. It's that love and care, springing from our Saviour's love, that makes Christmas special. *Thank You* for sharing! And, you are in for a treat when you read Christmas at Thrush Green. Her characters come alive in no time and she draws you into the story beautifully. Enjoy! What a lovely, lovely post... I giggled more than once (mostly thinking of the people at the Post Office with packages that might not pass muster and the Postal workers needing spiked eggnog!) I, too, love Winter Solstice, and it's been too long since I have read it. Thanks for refreshing my memory of the characters. 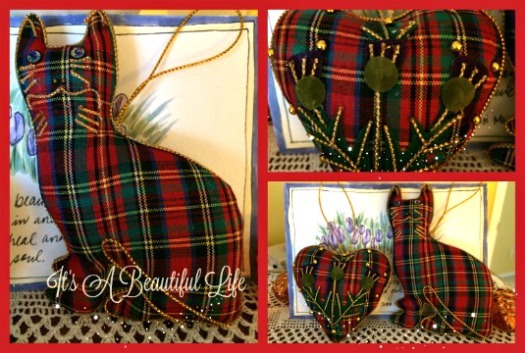 Love those plaid ornaments from Scotland, too. Bonhoeffer is one of my most admired writers. I am trying to make my way through Eric Metaxes' book about him. It is a good read but a large one. Merriest week before Christmas! FINALLY, I'm all caught up on your blog. Yay! As a former stamp collector, I always enjoy seeing the holiday postage stamps. The snowman and reindeer made out books is a cute idea. I'm also loving your charming Scottish ornaments. Have a good weekend, Brenda! What a LOVELY post! I especially love the paragraph about the post office. I was thinking the same thing the other day! I think part of it, for me, is just that sending or receiving anything in the mail is always a treat because mostly all that's ever in there these days are flyers and bills! Post office packages are almost a romantic throw-back to a different time already. Nice to meet a fellow western-Canadian!! Beautiful blog. Love the artwork!